Decide from the beginning if you want to have PAID submission or Membership Packages. 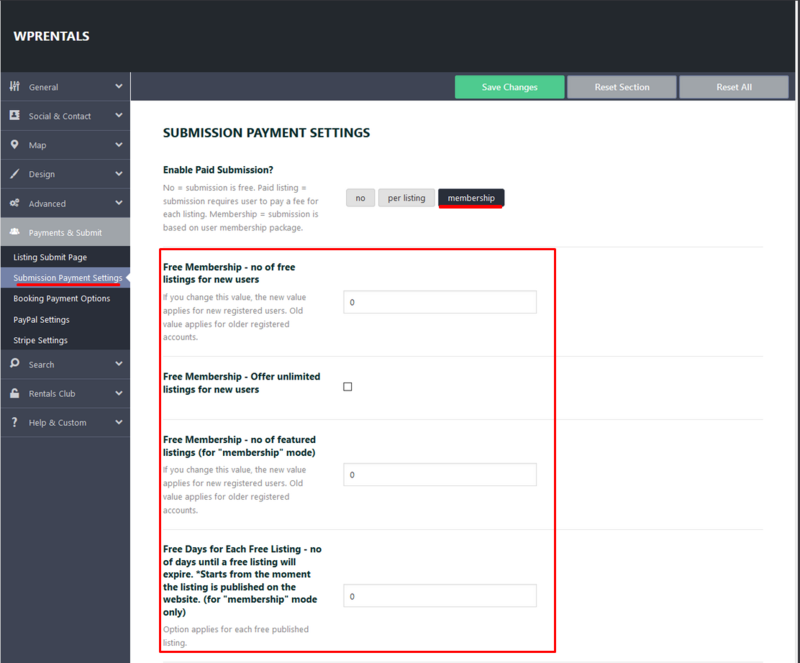 Membership allows users to “rent” display space on your site for their published properties. It’s a fee to have x number of listings published on your website for a certain time (x number = is the number of listings allowed in the active membership package). Multiple purchases DO NOT SUM listings. From Theme Options you can choose how many free and featured listings are included in the free membership, how many days each free submission stays published. 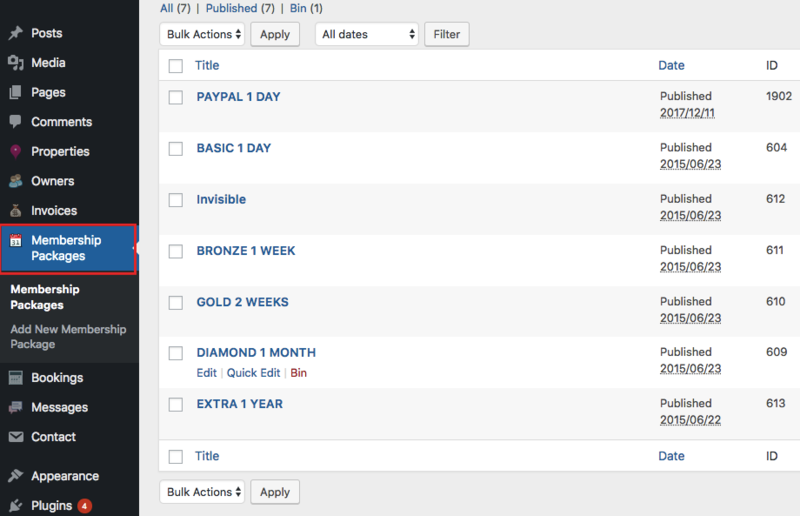 Free Listing expiration considers the publish date + the number of days set in admin. The user will be informed about every free listing expired via email. option to display package or not to user dashboard. The theme allows working with PayPal, Stripe or Wire Transfer. How to buy a package. How to upgrade a package. How to downgrade a package. Users see all packages in User Dashboard. A recurring checkbox is optional. It applies to PayPal or Stripe payments ONLY. 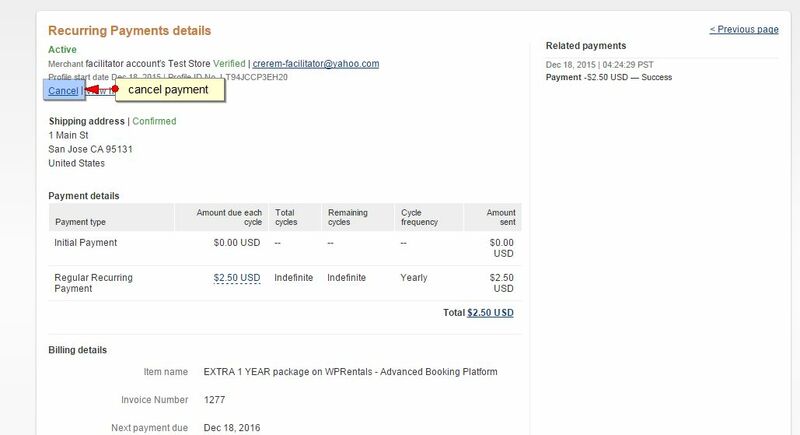 It means the payment will be taken automatically from client account when package expiration date is reached. If payment fails when done through PayPal or Stripe, the user will continue to have Free Membership by default (if it’s the 1st purchase) or they will be downgraded to free membership if it’s a recurring payment that failed to be processed. When users buy or upgrade to a paid package, they will receive the number of listings included in the package purchased. Listings do not sum. 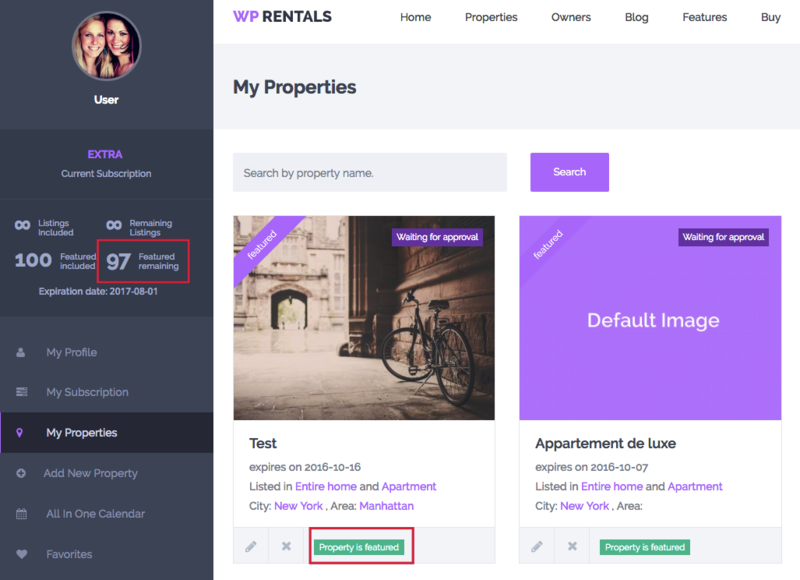 If users have already published an x number of properties, those properties will be automatically deducted from the number of available listings after buying or upgrading the package with more listings included. If the user deletes a property, that property is still counted as listing used, so the number of listings included will not change after delete. Users CANNOT have 2 packages at the same time. 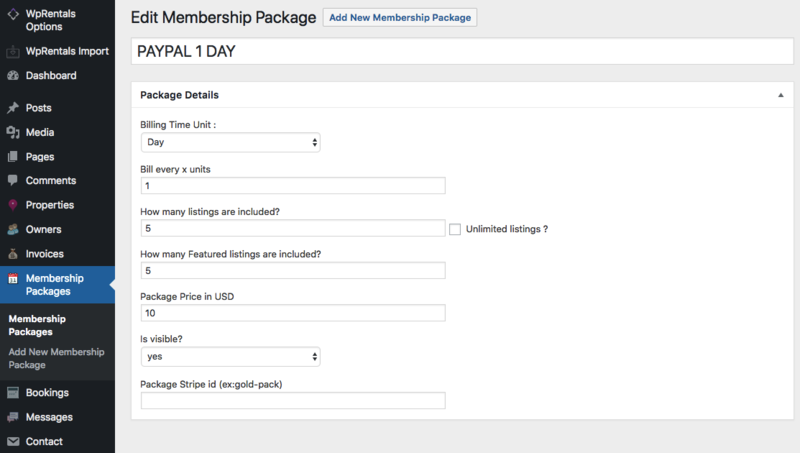 When the user upgrades to a new package, that new package limits will start to apply from the moment of the purchase, even if the user had x days/weeks/months/years from previous membership. If users downgrade to a package with fewer listings than his current number of published listings, ALL his listings will be set to EXPIRED and they will have to be resent for approval. 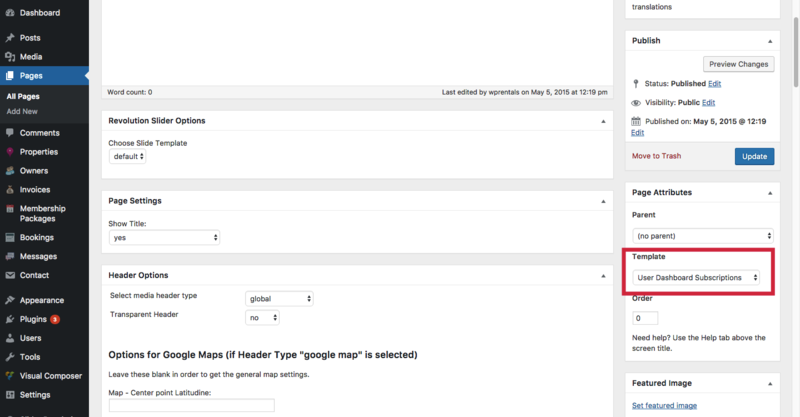 User CANNOT send to resubmit more listings than his current package allows him to. 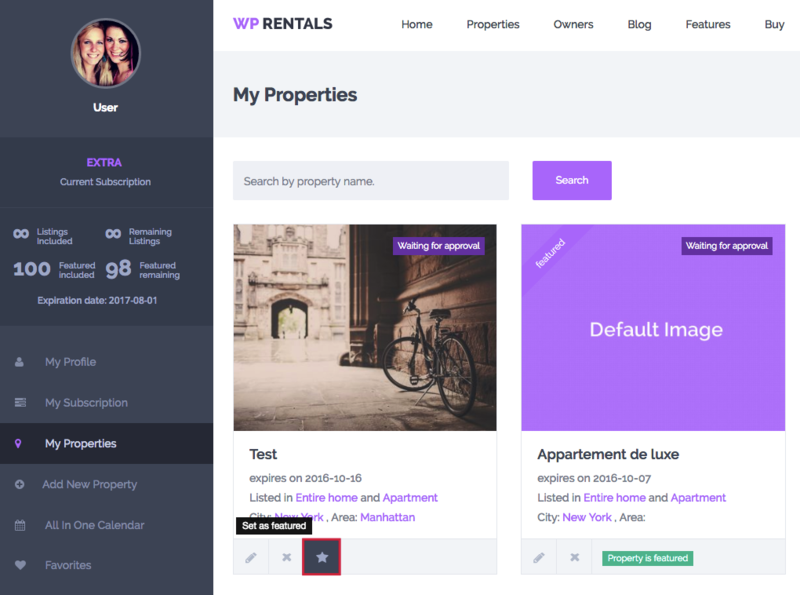 If the user has Published and Expired listings, and decide to upgrade/downgrade his membership package – in case the published properties match the number of included listings in a new package (it’s a smaller or equal number), the published properties stay published. 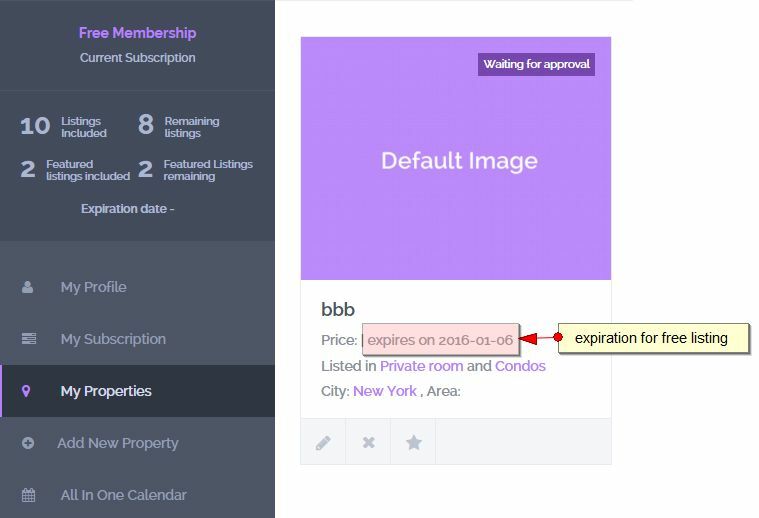 Expired listings stay expired. Once the user selects the property to be featured – the number of featured listings included is updated. Only admin can un-mark a property as featured and give the user manually another featured listing to use. The user cannot do that from his dashboard. How to cancel a package. A one-time payment will automatically be canceled by Stripe or PayPal at the end of package availability. 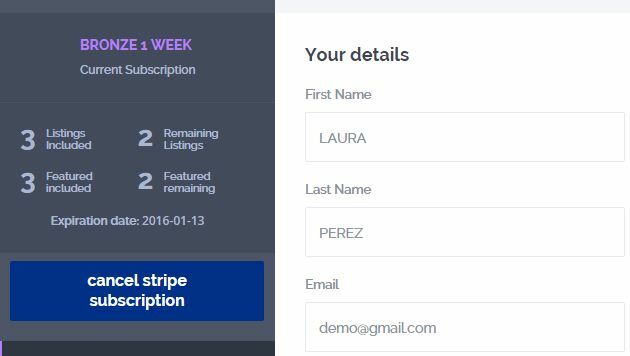 A recurring Stripe payment can be canceled from theme user dashboard. The package will expire at the end of package availability and it will not be renewed automatically. 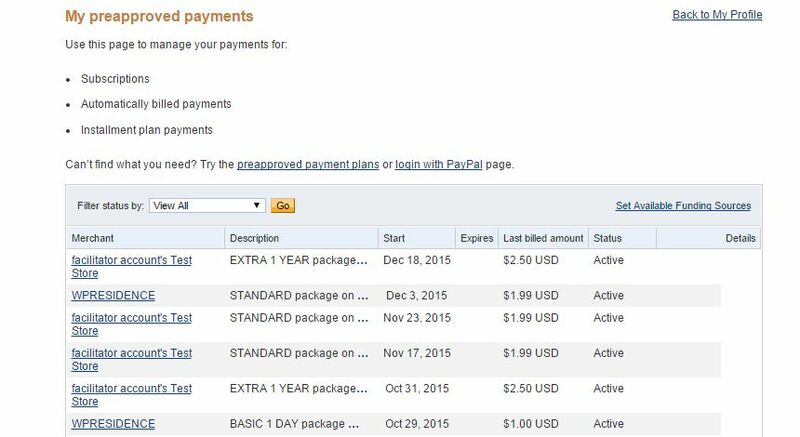 A recurring PayPal subscription can be canceled only in user PayPal account. The package will expire at the end of package availability and it will not be renewed automatically. If user’s package expires because he didn’t renew or he doesn’t have money, the package returns to FREE MEMBERSHIP by default. c. user downgrades his package to a package with less included listings than the number of listings he has published. The user is able to re-submit only the number of listings allowed by his current package.